It is very important to clean the carpets regularly, especially in hotels because of the high traffic of people. We must take care of hygiene and presence, and that is why The Provident Hotel has entrusted SERVPRO of Doral. There are many reasons for professional carpet cleaning, one it will increase the life of your carpets to have them cleaned regularly. The dirt embedded in the carpets rub together to prematurely wear out the carpet fibers. The appearance is better with clean carpets; health is improved with less soil and or dust in the home, office etc. The method commonly referred to as steam cleaning is better referred to as Hot water Extraction. This is where you apply a pre-spray and use agitation and a hot water rinse to remove the soap and soil. The agitation can come in the form of a machine applying pressure with brushes or simply using the wand which vacuums up the hot water sprayed on to the carpets to rinse out the pre-spray. There are different chemical requirements depending on whether or not the carpet is a synthetic or natural carpet fiber. Older surfaces, such as double jute-backed carpets and loose rugs with natural foundation yarns, could shrink after a wet treatment. Newer carpets, such as with synthetic backing and foundation yarns, do not shrink, and they smooth easily. The variety in carpet types and situations make a good argument to always use a professional carpet cleaner who has been trained and certified. SERVPRO ofDoral specializes in the cleanup and restoration of commercial and residential property after a water damage event. Our Crew is highly trained in property damage restoration. SERVPRO’s corporate training facility to regular IICRC-industry certification. We can be reached at (305) 594-2956. 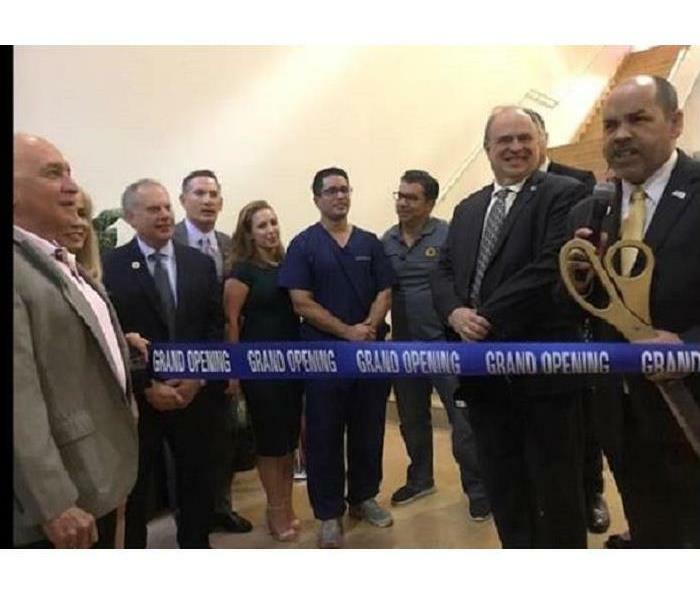 On March 1st, 2018 SEPA had a grand opening event for one of their medical office practice in Doral at the Firefighter Memorial Building. SEPA objective for this grand opening to ensure firefighters get the proper care they need while they are on the field. There are huge percentage of firefighters do not take the proper follow-up when they have a medical health issue. With this practice, it will be definitely help open doors and emotional support for family members who have their relative in the firefighter field. This is definitely will make things well for all around in the community. This location was brought the firefighters that lost their lives while helping others in the community. It is a beautiful remembrance of such great people. SEPA’s mission is to help the physician and business partners achieve their success that will eventually turn into high quality healthcare. They sincerely care about the community and always willing to help as much as they can and more. We also had the mayor of Doral at the grand opening, J.C. Bermudez. We definitely like helping our clients to ensure their happiness is always granted. We always continually want to always have excellent service, fairness and mutual respect. With this special invitation their grand opening and their growth in the company it is great. We appreciate it so much. As well, we thank Doral Chamber of Commerce for us meeting them in a Carnival Victory Cruise Line in making our business relationship prosper. SERVPRO SMRs during dinner ceremony. 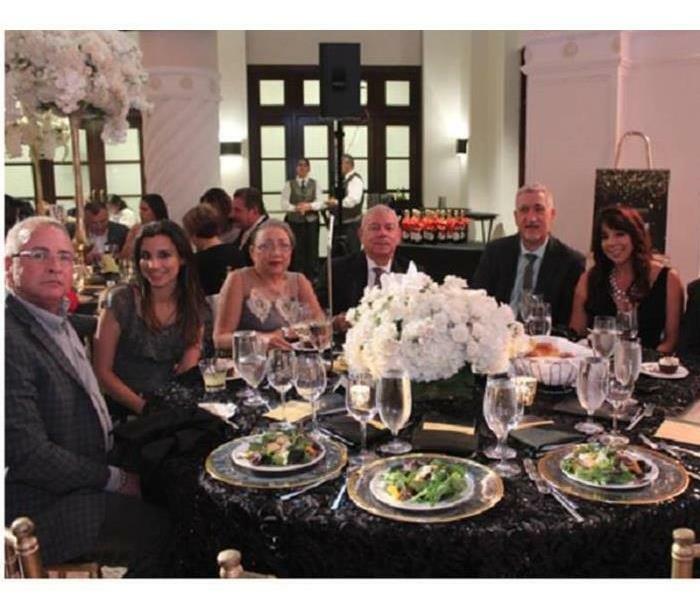 We at SERVPRO of Doral participated at the Toby’s Awards 2018 this year. It was a great exciting time for property managers to get together. We even were the platinum sponsor this wonderful event. The theme of Oscar’s Night; it was a night fulfilling, with other SERVPRO in our area. It was nice to get everyone together and celebrate special time. These are the Toby Awards, is known for Outstanding Building of the year is the most prestigious and comprehensive program of its kind in the commercial real estate industry. This event recognized properties that showed superior building quality and management practices. Being eligible for this event for property managers, it is all of the commercial office and industrial building, but it has to be met with BOMA International’s TOBY Committee. For them, winning these awards meant a lot because it brings a great marketing edge tool to lease/and or even to sell a building. As well, the staff gets a special recognition for the TOBY submission process. A TOBY award enabled to highlight to ownership all the hard work completed on behalf of the building of the property managers working together. It was so nice to get to have met the people we have done work for in the past. Being part of this nice event; it sure helped us to have showed more emphasis that we are great, valuable company for our client and prospective clients. This will help us grow in large to continue to trust us with the restorative services, and not only that, but also minor cleaning and other things do we to provide to make our franchises grow. We sure cannot wait to continue to help BOMA and their properties whenever there is issues. We are SERVPRO of Miami Lakes/Doral we want to continue to do excellent service, fairness and have mutual respect. As SERVPRO of Doral, we have been active members with our communities, we had an event on January 26th, 2018 at the Carnival Cruise Line – Doral Chamber Power Luncheon. It was indeed a great experience where we got a chance to meet other business professionals to help each other grow. We had been an active member of Doral Chamber of Commerce, we go to many of their events because we see SERVPRO of Doral as a team to work together in the community. We had phenomenal food and dancers in the cruise. It felt like a true experience of being in a cruise, but with that exception that we are not sailing away to…Cuba!. 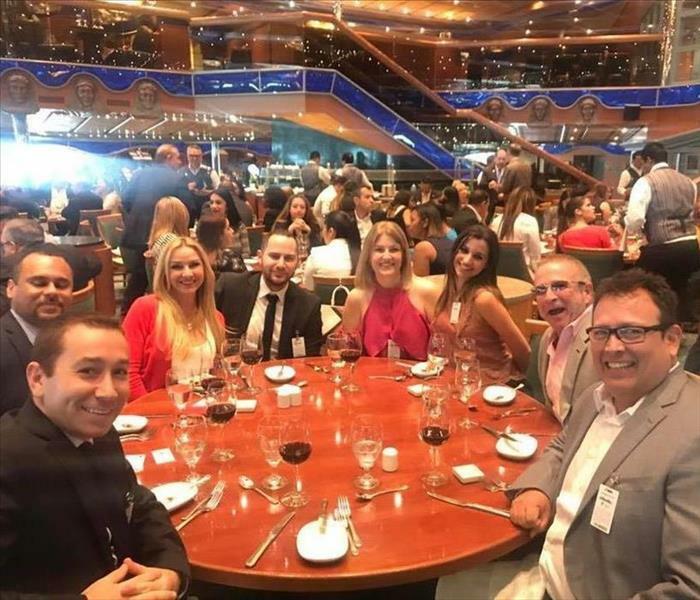 That is a joke that Manny Sarmiento, president of the chamber of commerce of Doral, says when we go to these Carnival Cruise Power Luncheon Meetings that usually happens about three times a year. We had enjoyed our times and we had enjoyed everyone. We want to make SERVPRO of Doral a continuation of servicing others and sharing this SERVPRO experience to others. As a main speaker, we had William Talbert III from Miami Convention and Visitors Bureau telling us tourism business did not get affected from Hurricane Irma. We have a bunch events coming up in our way, so we had been growing such a positive way in the business world. He shared the story of the “Funny Socks Club”, as Manny Sarmiento was saying, and “Bill” as they had call him as the co-founder. Doral Chamber of Commerce had been great part of in our lives, networking and great return of investment. We have definitely enjoy the experience of helping the community. We also had the Carnival Cruise waiters danced the “Gangnam Style”, song it was great phenomenal experience that other business professionals have to enjoy at least once. We thanked Manny and Carmen Sarmiento, Azahy, and other Doral Chamber of Commerce members for this great luncheon.